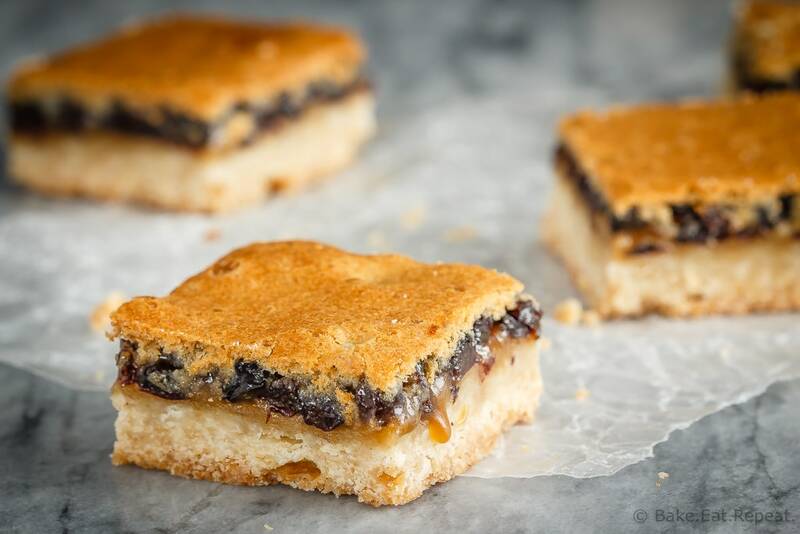 These butter tart squares are basically butter tarts in bar form – a shortbread base with a sweet topping made with butter, sugar and currants. Perfect for your holiday baking! Ah, butter tarts. The best Christmas time treat. Well, except for Nanaimo bars. Or whipped shortbread cookies. Or….well, let’s just say that there are many treats I enjoy at this time of the year. But butter tarts are definitely one of the favourites around here. These little squares are a variation on the traditional butter tarts that we make every year. Instead of a pastry tart shell, they have a crisp, buttery, shortbread base. 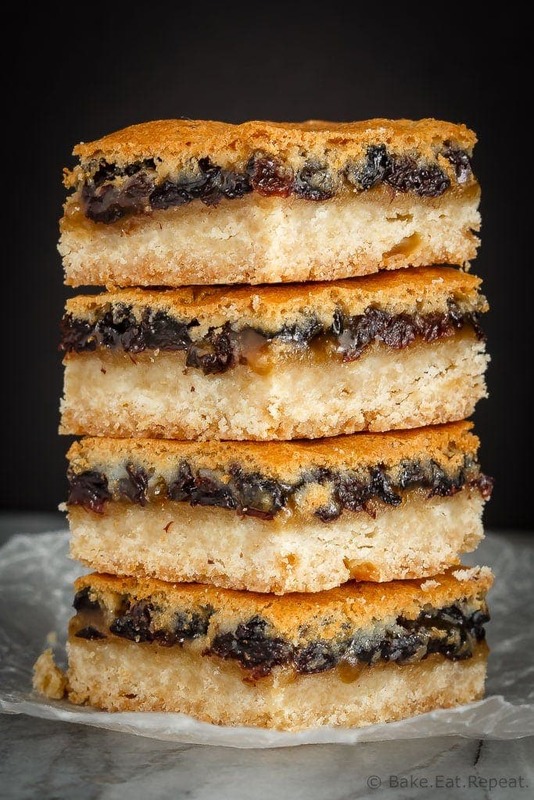 The filling is pretty much the same, just a bit thicker so that it can be cut into squares – basically it’s butter, brown sugar, and currants – and it’s delicious. If you’ve never had butter tart squares, I think that you’ve been missing out and should probably make these immediately, if not sooner! 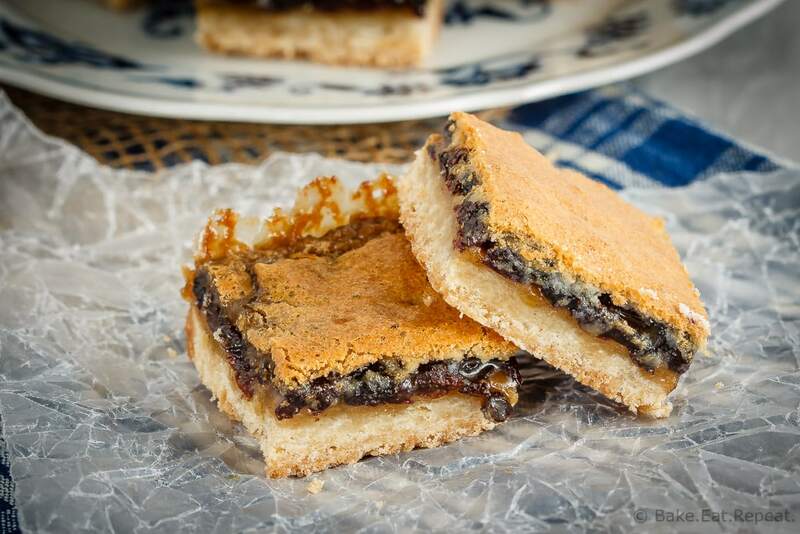 We like currants in our butter tart squares – although they’re really the only thing (besides regular butter tarts, of course) that I ever use currants in. They just aren’t as tasty with something else. It needs to be currants. I’m sure many of you are saying that’s ridiculous and butter tarts should always have raisins, or pecans, or some other crazy thing in them. But you’re wrong. It’s currants that are the best. That’s just a fact. 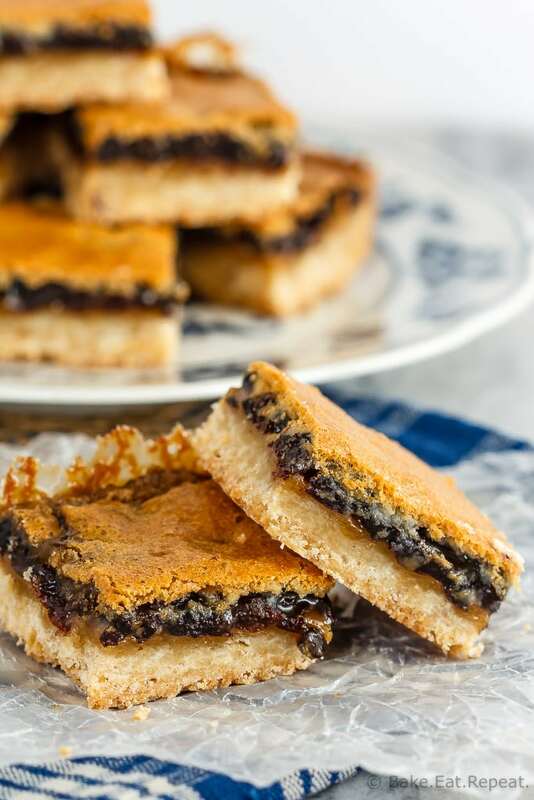 These butter tart squares are butter tarts in bar form - a shortbread base with a sweet topping made with butter, sugar and currants. Perfect for your holiday baking! Preheat the oven to 350 degrees F. Line an 8x8 inch baking dish with parchment paper, or spray it with non-stick cooking spray. In a food processor, or stand mixer, make the crust. Cream the butter until light and fluffy. Add the flour and brown sugar and mix until it is well combined. It will resemble coarse crumbs. Press this mixture firmly into the prepared baking dish. Bake for 15 minutes, until it is just starting to brown at the edges. Meanwhile prepare the filling. Cream the butter and the brown sugar together until light and fluffy. Add the cream, egg, vanilla and flour and mix until well combined. Stir in the currants. Pour the filling onto the cooked crust and bake again for 20-25 minutes, or until the filling is golden brown and bubbling around the edges. Let the squares cool completely before slicing them. Store the squares in an airtight container at room temperature for up to 5 days, or freeze them for up to 3 months. Note: I have used milk or half and half in place of the heavy cream in the recipe and it still turns out great, if you don’t have any cream on hand and don’t want to get some for 2 tablespoons. If you don’t care for currents, you can use raisins or chopped pecans in these bars instead.